For many families and individuals, the experience of attending a performing arts program is hindered by physical or developmental challenges. In fact, nearly 1 in 5 individuals have a disability according to the U.S. Census Bureau. Visitors come to organizations needing many different types of accommodations. To achieve our nonprofit missions, it is important that everyone is able to engage with programming. Most arts organizations have long considered accessibility adaptation for the visually and hearing impaired. In 2013, Seth Laidlaw conducted a survey of arts organizations and assistive technology services. Among survey respondents, 77% offer America Sign Language, 70% offer large-print programs, 48% provide open captioning, and 57% support audio description. Through his research on “Increasing Inclusion Through Assistive Technology,” Seth explored the broad definition of assistive technology and the need for arts organizations to establish initiatives to reach beyond compliance with the Americans with Disabilities Act. Still, only a select few organizations have begun to consider programming for those with sensory and developmental disabilities. As reported by Autism Speaks, 1 in 68 American children are on the autism spectrum. By neglecting this significant population, our institutions are failing to serve a huge number of families. Sensory and developmental disorders, such as autism, may cause behaviors deemed socially unacceptable by the general public. For those on the autism spectrum, certain aspects of a show may trigger loud or sudden reactions. Sensory-friendly programming creates a performance environment where the traditional theater rules are relaxed to better accommodate a variety of audience members. Children can react to the performance and freely move around without disrupting other patrons. House lights are kept partially on so families may enter or leave the theater as needed. 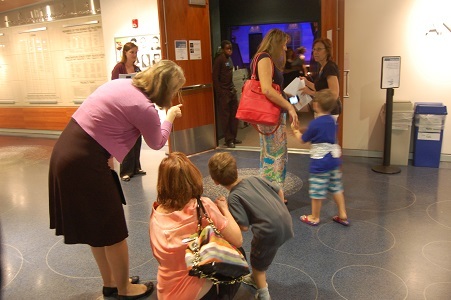 Some programs provide preparation materials and active and quiet areas in the lobby where attendees can go to get away from the crowd, or to connect with the performance in a different way. Successful sensory-friendly program implementation can require time to determine the best organization-specific practices to retain quality, encourage broad access, and properly train staff and artists. Still, organizations implementing such programming have seen consistently positive feedback and continue to expand offerings to further improve engagement. I recently had the opportunity to volunteer during a sensory-friendly production of Pittsburgh Ballet Theatre’s Beauty and the Beast. Watching people from all walks of life come into the theater to enjoy the production was an incredibly moving experience. Families came with children of all ages – from tiny toddlers dressed as Belle to teenagers and even grown children with autism. They were joined by groups of special needs school children, a group of severely disabled adults, local high school and elementary school groups, and even a senior citizens group from a nursing home. It was inspiring to watch as everyone arrived at the Benedum Center to enjoy a performance that truly brought the community together. While it was different to sit in the hall with the lights on and to hear excess noise and spontaneous claps, it was powerful to know those people were fully engaged and deeply moved by the ballet. This introduction is the first in a series of posts on sensory-friendly programming. Based on my interviews with several sensory-friendly program directors and artists from Pittsburgh Ballet Theatre, Imagination Stage, The Kennedy Center, and TDF’s Autism Theatre Initiative, I will discuss some of the best practices and important considerations for program development. Join the conversation and share your experiences with sensory-friendly programming below.